Emojis & Marketing Emails: A Match Made in Heaven? A big shocker is that Apple and Gmail, the first and second most used email clients in the United States, support emojis in email subject lines. Both of these brands have been very careful as to what they deem acceptable for user design and experience standards. So how can you, as a world-class marketer, use emojis in your email marketing? While it isn’t a bullet-proof method of increasing open rates, if done appropriately and tastefully, you can garner some benefits. Take, for example, the two email aficionados in the screenshot above, Microsoft Rewards and MailChimp. These are two large organizations that know email marketing well — and they’re using emojis in their subject lines, and probably enjoying higher open rates, too. In fact, research completed by Experian shows that 56 percent of email marketers who used emojis in their subject lines had higher open rates. When I first saw that number I thought that 56 percent isn’t that far off from 46 percent… and if it was 46 percent, then it would mean the rest either saw neutral or negative results. So, why mention the Experian findings at all? With the increased use of emojis in other communication channels, the open-rate benefit of using emojis has increased even further. 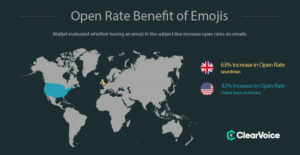 Mailjet shows that Brits and Americans are 63 percent and 42 percent (respectively) more likely to open an email if it has an emoji in the subject line. Mailjet reported on one campaign that used the crying emoji in its subject line — and open rates increased a whopping 95 percent. It is rather easy. If your email sending tool support emojis (most do these days), you simply copy and paste the emoji icon into the field where you’ve got the rest of the subject line. This article from Mailchimp lists the 15 most commonly used emojis. These are all safe to use. If you’d like to use these from Mailchimp, you can find them, and a slew of other “safe” emojis in this classic emojis list. Remember to test, test, test, though. If your emojis don’t render properly, you’re going to see something that looks like the below subject line — which looks like spam and can decrease your open rate. Will emojis work in all email clients? Absolutely not. Hence, the last paragraph’s guidance that you must test your subject lines before pushing send. Apple Mail (desktop version) – Nearly full support. Apple Mail for iPhones/iPads – Nearly full support. This email client has some emojis that aren’t supported and some other proprietary ones that are supported only on this device. Gmail – Nearly full support. Yahoo! Mail – Nearly full support. Windows Mail – Nearly full support. Android Mail – Nearly full support. Note, that I’ve said “nearly full support” because there is no one source of all emojis that work or don’t work in all places. Your mileage may vary. If you’re looking for emojis, GetEmoji.com has the full array of them listed out by category. It isn’t perfect, but it’s a really good website which I use when choosing which emoji to use. As mentioned earlier, if you want just “safe” to use emojis you can grab them from their classic emojis page. Findings from Alchemy Worx (summed up nicely here) show that using the right emoji at the right time is imperative to better open rates. For example, from the graphic below you can see that the snowman emoji had the best performance, increasing open rates by 65.72 percent. However, this likely has a strong correlation to it being used in conjunction with holiday-related messaging at a time of the year where people are happily awaiting the winter holiday season. It doesn’t though. I’ve searched extensively — and so have others — through the industry’s leading email marketing websites and found no indication that emojis trigger spam filters. It would be easy for Apple and Google to not support emojis in email subject lines, but they have chosen instead to support them. This doesn’t mean that you should go crazy with emojis. More than one or two in a subject line will likely get you in trouble; if not from the email client, then from your recipients, who may think it’s tacky. Even though I’ve seen success with emojis in past email marketing campaigns, I’ve never used them in a highly professional setting. My current employer, Kuali, creates and sells software that helps universities better manage their business practices. We sell to presidents, provosts and other leaders at universities. While I haven’t used emojis in any messaging to this audience to date, I’m going to start working them in. I’ll test it first on customer advocates who are least likely to mind, and if it goes well there, then I’ll move the strategy into our next audience that’s least likely to have a negative reaction. I expect to have my own findings, based on a professional audience’s reception of emojis, within the next few months. I’ll be sure to update this article once I have it. I’ll also post my findings to the comments below, so if you’re interested in finding out how it went for my professional segment, just comment below and Disqus (the comment tool) will give you an alert once I’ve updated.